Weather: Chilly with periods of sun, clouds and some rain. Temperatures during the day between 16 - 20 degrees. During the night it was already quite cold. In Vosu, in the north, it was just above 0 in the night. General: In general Estonia is the most expensive of the 3 Baltic countries. Fuel: As diesel is slightly more expensive then in Latvia we stocked up there. As we can carry 200 liters there was no need to get fuel in Estonia. So no data on the costs. No visa needed for EU citizens. General: All roads we drove are tarmac and in good condition. To Kiipsaare lighthouse: to road to the parking area from where you must walk is off road. Rough and slightly rocky in some places but when not very wet it should be doable with a normal car. 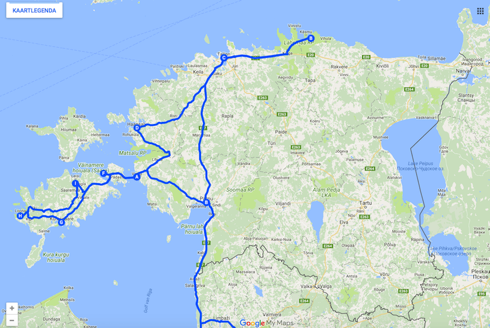 Ferry to Saaremaa: € 14,50 for a one way ticket for 2 people and 1 car. The Landcruiser was charged as a normal car here. Laheema NP: We just drove through the area and stayed 1 night in Vosu. So we cannot judge the area very well. You probably need to do some activities. Just driving through you mainly see forests which for us was quite boring. Vosu: small not very special village but the bar is nice. Tallinn: For us the most beautiful city of the 3 Baltic capitals. We really loved this place. There are so many small streets, squares and amazing buildings to discover. Best to get here with public transport as parking is quite expensive (€ 1,50 per 30 minutes). KGB museum: located on the top floor of the Viru hotel (opposite the old town). You need to book a tour in advance to visit it. We did not go here. Must be good from what we heard. Muhu & Saaremaa: Islands just of the coast of Estonia. We liked driving around the island and visit some small villages and enjoy the views. Paldiski: Known for its steep white cliffs. Finding them was a hassle as they are not signposted. To us the cliffs were dissapointing as they were nothing special. The cliffs at Panga at Saaremaa island are nicer. Kiipsaare lighthouse (on Saaremaa island): old tall lighthouse at the northern tip of the island (due to erosian it is now located in the sea). To get here you must drive an offroad track untill about 4 km from the lighthouse. There you can park your car and walk the last 4 km. Koguva (on Muhu island): small but very beautiful countryside village at Muhu island. The houses made of stones, wood and with thatched roofs covered with mosses perfectly blend with the lush green surroundings. Kuressaare (on Saaremaa island): Nice village with some beautiful old houses. One of the 3 major spa retreats at the East Sea coast. During sovjet times a popular holiday location for members of the communist party. Panga Pank: Seaside area known for its cliffs. Not sure if it is allowed but this would be a good spot for wild camping especially in low season (you will probably have the place for yourself then). Rummu underwater prison: visiting is at your own risk but the place should be very special (see info on atlasobscura). We however did not succeed in finding it. All roads that we found had a dead end or closed gates. O'Korts in Vosu: Nice bar to hang out. On the terrace you will have sun untill just before the sun sets. Ku-Kuu restaurant in Kuressaare: Famous restaurant in the area. We had lunch here. The food was good although not the best we ever had. Special was the atmosphere though. We had a nice table in a corner with the tainted windows. VOSU, O'Korts, nice place to have a drink and hang out on the terrace. The terrace has sun untill just before the sun sets. PALDISKI, it is a waste of time to go here. The town is not nice and the cliffs nothing special. Looks much better on the pictures than in reality. KUIVASTU, Ferry from Saaremaa back to the mainland. KOGUVA, small but very beautiful countryside village at Muhu island. The houses made of stones, wood and with thatched roofs covered with mosses perfectly blend with the lush green surroundings. KIIPSAARE Lighthouse. This waypoint is the parking area from where you must walk the last 4km. To get here you must follow an dirt road. SAAREMAA MUSTARD, somewhere along the road. Place that sells traditional home made mustard in all flavours. Some of flavours come from plants typically for the region. PANGA PANK (at Saaremaa). Know for its cliffs. Also nice seaview from here. RUMMU Underwater Prison. Should be an amazing place but it is hard to find. We tried to get there but all roads and entries we tried were dead ends or entry was blocked. COPYRIGHT (C) 2017 WWW.2XPERIENCE.NL. ALL RIGHTS RESERVED. DESIGN BY BELINDA BEHLING.